Tong Ho 茼蒿 | Tainong Seeds Inc. There are mainly two kinds of Tong Ho. 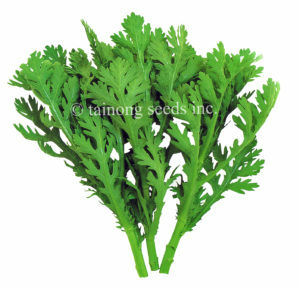 One is Small Leaf Tong Ho, with small and deeply serrated or lobed leaves and grows faster. Most varieties of this type is slowing bolting.The other is Broad Leaf Tong Ho, with less serrated, more rounded, thicker and larger leaves, but usually less cold tolerant and less aromatic than the former. Tong Ho is both an herbal medicine and a cooked vegetable. 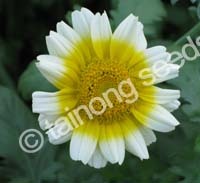 Tong Ho is edible chrysanthemum or cooking chrysanthemum, which looks very much like the leafy portion of the ornamental version. Fast, vigorous, and high yielding plant with numerous side shoots. 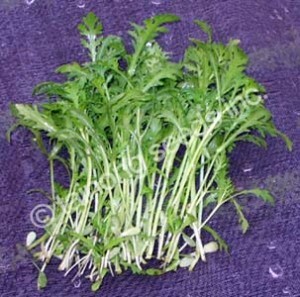 Fine, serrated medium sized green leaves with excellent aroma and flavor. Harvest in approximately 30~35 days. Broad leaves are more tender, aromatic and tasty. Harvest in approximately 30-35 days. 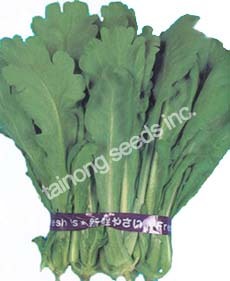 New shungiku variety with delicate, finely serrated leaves. Delicious, tender with light Chrysanthemum flavor. Harvest in less than 30 days. Use as baby green, very tasty addition to salads.